If this is your first time consigning, we encourage you to read through how to tag once. For future sales, this guide becomes just a reference if you need a quick answer. You can also ask veteran consignors in the private ‘I Consign with Tiny Tots’ Facebook Group. Make sure you rifle through rooms, closets and bins for clothes, bedding, strollers, high chairs, toys, books and everything else you no longer want/need taking up space in your home. Be sure to be picky and check our list of not accepted items too. We don’t want you to waste time tagging items that won’t sell. Once everything is in more or less one spot – wait for that rainy day, sit down with your computer or laptop, and get started! You can still print tags entered into the system. Don't forget to pick up 2 Consignor Passes! Once you’ve registered, you keep your consignor number and password, so start by LOGGING IN. Items should be priced in $.50 increments ($2.00, $2.50, etc.). Items will generally sell for 1/4 to 1/2 of the original price. However, make sure to keep the age and condition of the garment in mind when pricing. Sets tend to sell better than separate items, so match if you can. For clothing, group like items and price as one. PLEASE NOTE: If you choose “YES” to donate the item, that item will automatically be marked as “YES” to discount. Once you have entered item information, print the tags on card stock. 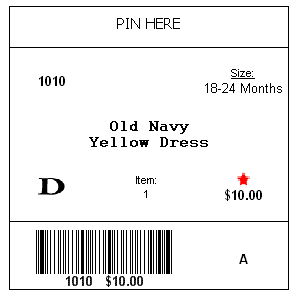 Tags can be printed in batches or all at once. Use the top portion of the tag to insert safety pins or hole punch for attaching the tag to the item. Review the list of items which we will accept. Feel free to email us with questions if you do not see an item you would like to sell. We accept specific types of clothing and other items according to the upcoming seasons. Our Fall sale is our fall/winter sale and the Spring sale is the spring/summer sale. Please comply with these parameters, so you do not waste time tagging items that will not be accepted. Your items will be inspected at drop-off and any unsuitable items will be returned to you at that time. Accessories such as socks, hair bows, ties, hats, belts, etc. Formula, open packs of diapers/wipes/pacifiers, etc. Any items that are overly worn, torn, missing pieces, non-working components, outdated, stained or dirty. Toys, books, DVD and other play items sell very well…consignors typically get caught up in getting all of their clothes tagged and forget other very profitable items!. While everything that is fairly priced sells well at the sale, the percentage of toys and large items brought to the sale and are sold is high. So don’t forget to clean out those toy boxes and playrooms! Self-inspect your clothing before you begin to enter your items – any clothing with stains, tears, pilling, missing buttons or snaps, outdated style, smoky or musty odors, etc. will be removed during inspection, it will save everyone time at check-in if you remove those items at home first. It is ok to use NO DISCOUNT, but please use it sparingly. Pricing should be competitive if you are using No Discount – and primarily for unique items. Often times, what is left at the end of the sale are the clothes that are either overpriced or No Discount or both! Worn Target sleepers will not sell for $4 when you can easily purchase new for $6-7. Tiny Tots Consignment Sale shoppers expect quality items at bargain prices – and sellers, who make the most money, price to sell and take little to nothing home! It is a win – win! PLEASE DO NOT TAPE OVER BARCODES. Please do not attach more than one tag per item: If your item contains more than one part/piece, describe all pieces/ parts on only one tag. All items must be tagged. Please check your items for stains in a well-lit room. Items with stains may not be put out onto the sales floor. Attach the tag with a safety pin (no straight pins) to the upper right corner of the garment as shown in the picture. All clothing with the exception of onesies and other small items must be hung up on hangers. Try to tag in good lighting – we often catch stains that we’d otherwise spend time tagging if we weren’t by a window. Many places with uniforms, Old Navy, etc. will give away hangers if they have extras available. The hangers you brought cannot be returned at the end of the sale. We do our best to collect them for the Fall consignors and offer them at Consignor Pick Up. Please place shoes in a ziploc bag and tape the bag shut with the tag inside the bag. We are VERY picky about shoes. Any shoes that have scuffs, or are very loved just do not sell. Oddly enough, shoes in shoe boxes tend not to sell as well. Toys should include ALL parts and be in full working condition. Any small or loose parts can be packaged in a zip-top bag. Attach the bag to the main item with packing tape. If a toy requires batteries to operate, they must be included to insure the buyer the item works. (Toys without working batteries will be removed from the sales floor and returned to you.) Dollar stores and Big Lots sell super cheap batteries. Attach tag to the item using packing tape, zip ties or string. Make sure tag is secure. We will NOT be able to sell any item without a tag. Puzzles are best packaged by wrapping in plastic wrap and then sealing with packing tape on the back. Some puzzles are made of paper – do NOT attach tag to the paper fronts, it will rip the puzzle pieces. We will only accept talking and interactive stuffed animals type toys – in like new condition. No regular stuffed animals, please! Bibs, bottles, barrettes and bows, sippy cups, smaller toys, etc. should be in clear Ziploc bags with tag taped on the outside or placed inside of the bag. Used plastic bottles do not sell well. Attach tag to the front of the book with tape – blue painters tape is the best! Multiple items can be placed in a Ziploc bag with tag attached to the front with tape. Make sure that DVDs are in working condition and inside the correct case. Attach tag to the back cover of the DVD with tape. Also attach tape to seal opening, we don’t want shoppers opening cases. No PG13 or R rated movies. Infant equipment, large outdoor toys, etc . . . Attach the tag using packing tape, or zip ties. Attach a small piece of tape on the bottom of the item with your consignor number and selling price. If the tag is lost/missing, we will still know who the item belongs to. Large Little Tykes toys and furniture are in high demand! Must be clean and in working order (batteries included.) Small parts must be bagged and attached to the main part very securely. If parts get separated the item will not sell. Nursery and youth furniture and room accessories have been very popular! You will need to reassemble the items – we have often tried to assemble them ourselves, only to find that screws are missing, etc. We then have to pull it from the sales floor. Instruction papers, warranties, etc. attached to strollers, exersaucers, cribs, etc. are an added bonus for buyers. You can go to the manufacturer’s website and download instructions, which should include the retail price so people know what kind of deal they are getting! Please include all important information regarding the bedding set being sold (ex. 6 piece infant bedding set includes: quilt, bumper pads, dust ruffle, sheet, rug, and diaper stacker). The more information you give the buyer, the better the chance your item will sell. Bedding sells BEST when draped over heavy-duty hangers (or 2/3 regular hangers tied together). Be sure the tag is secure. When tagging bedding put size of bedding (ie. Twin, King) and a detailed description including colors and print, then list the parts/pieces of the set. For best results package in a large clear bag, and secure all pieces to each other. You can do this by pinning or cable ties through the loop of the tags. We would not recommend trying to secure the bag shut, as buyers will open to inspect bedding. Your car seat must have been manufactured within the past six years. It must not be subject to recall or have been in an accident. Review the used car seat check list to determine if the seat is salable. All seat covers and straps must be thoroughly cleaned! Or we will pull them from the sales floor. Attach tags using tape, or safety pins, unless it is large or wooden furniture then you can punch a hole and tie a string or ribbon. You do not want to use tape on wood furniture, especially painted wood furniture. Artwork and photo frames should be tagged by taping the tag on the front of the piece directly on the glass preferably on the top right hand corner. The way in which the art has to be displayed makes it hard for buyers to find tags if they are not on the front. Canvas artwork or non glass artwork obviously needs to go on the back so as not to ruin portrait. Blue Painter’s tape is the best! Our online tagging system allows each registered consignor to inventory the items. Each consignor inputs all of their item information, such as gender, size, description, price, donate, and discount all online and then is able to print out all of their tags. Once an item is purchased at the sale, we scan your barcode. You will be able to see which items have sold once all the tags have been scanned in the system. Price: Price item in $.50 increments. Description: Write description that allows us to confirm the item (dress, capri set, shirt, shorts, etc.). You must use white card stock to print out the tags. No tags will be accepted on standard paper as they may get lost and/or torn. When printing tags, the layout should default to 6 tags per page. Do not print using the “best” or “excellent” quality print option as this renders the bar codes unreadable by our scanners. If a change needs to be made to the tag once you have printed the tags, you MUST make the change in the tagging system and print a new tag! Gently worn or new Seasonal baby, children’s (infant to children’s size 14) and maternity. We cannot accept items with stains, holes, or overly worn. Please mark the correct sizing of all items – hats, leggings, socks, etc. If it doesn’t have a size, it doesn’t sell. Shoes, toys, baby equipment and furniture, bedding, dvds, bikes, sporting goods, games, books, puzzles, car seats, strollers, highchairs, outdoor play, anything to do with kids. If you have equipment that requires assembly, please bring the proper tools for assembly. You are responsible for putting the item together (cribs, swings, etc), this helps sell your item. If you have the original manual to the equipment, put the manual in a Ziploc bag and tape or safety pin it to the item. All articles should be clean, complete and in good working condition. Please be highly selective and do not bring stained or worn out clothing or clothing missing buttons or with holes in it. All baby equipment should be clean, complete and in good working condition. Also, do not sell toys unless they have ALL of the parts. If an item is battery operated, make sure that is has working batteries in it when you sell it so that people can tell that it is in working order. Please help us maintain a high standard of quality by only bringing items that you would want to purchase. Click here to make sure your items have not been part of a recall ~ we are not allowed to sell any items that have been part of a recall. We cannot sell any drop side cribs. Please DO NOT BRING ANY CRIBS with sides that are movable. This process is simple and will make the TINY TOTS Consignment Sale efficient and accurate. Please use ONLY CARDSTOCK TAGS! Please don’t use stickers, paper or write on ziplock bags. Handwritten tags are not permitted. Tags must be from our online tagging system. We no longer require consignors to leave a box or bin for pick up. Yay! To ensure a smooth drop off & pick up, please look over the info below. It can make a significant difference. Consignors must utilize the DROP OFF feature on their consignor account to select a specified time to drop-off items before the sale. If you are consigning more than 200 items, please sign up for 2 back-to-back slots. At the gym of Old Greenwich Civic Center, have your items sorted by gender and size before arriving. Please check in at the Check-In table. You will need to confirm your consignor number and info. You’ll drop your items onto the appropriate front table. We will be checking your items for tagging. Any items that do not meet the quality guidelines will be refused and donated immediately at the end of drop off. Remember: we WANT you to sell the most, and we don’t want to refuse anything, so please be super picky before you start tagging. Don’t waste time tagging items that can’t be accepted. You do have the option of waiting up to 30 minutes to receive any rejected items back. Please make sure you follow the guidelines. More Info on what we look for can be found HERE. We ask that you bring large furniture, outdoor play, etc. directly to the sales floor. We often have help with large items. *Don’t forget any tools or hardware needed to assemble any equipment or furniture you are consigning (Consignors are required to assemble any equipment or furniture consigned). Also pick up your Consignor PreSale passes; all consignors will be given two passes. Spouses require a pass to enter the sale. Only people with passes will be able to enter the Consignor PreSale. All unsold items are available to be picked up Saturday after we break down. All items will be sorted for you by consignor number. Be sure to check the ‘Lost and Found’ area to make sure none of your items were separated from the tag. Unsold items that are not picked up will be donated to charity immediately at the end of the scheduled pick-up window. If your items are not marked for donation and you fail to pick up, we have to assess a $10 fee to offset the extra cost of truck rental. We regret that no alternate pick-up arrangements can be made. Please have a friend pick up your items if you are unable to do so. We are not responsible for lost, damaged, or stolen goods. We are not responsible for unsold goods due to lost tags. After the sale, we calculate your earnings as 60-70% (depending on whether you volunteered for 2 shifts) of the selling price on each item you sold. Also, if you chose that any unsold items are marked Donate All (meaning you your tags show the printed ‘D’ for Donate) then you will also be credited the $10 registration fee! You will receive a check in the mail within 10 days. Lost checks will be re-issued less a $30.00 bank assessed lost check/stop payment fee. We created this resource in case you’ve put the kiddos to bed and have a dedicated few minutes to work on consigning, but a question pops up. Thus the over-the-top detail found below. Register to be a consignor, you will be charged a $10 non-refundable consignor fee. Login to our online tagging system use your seller/consignor number and password. Remember if you choose to mark as Donate any items that are unsold at the end of the sale (your tags must be marked with the printed ‘D’ for Donate) your $10 consignor fee is credited in your earnings check! Yay! 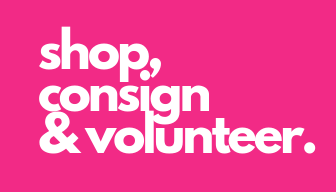 If you do not show up to consign, you will not be able to get your consignor fee back. Consignor fee is non-refundable. 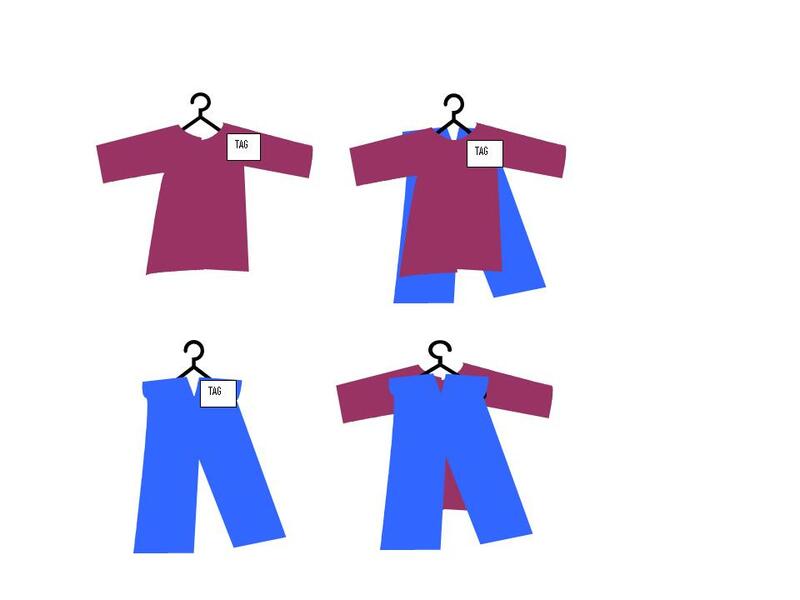 Next, arrange your clothing items in order by gender and size. Enter price – Must be in $.50 increments. As a general rule, price your items at 1/4 of the original retail price. If an item is like new and name-brand, you can price it higher. If an item has been well loved and not name-brand, it should be priced on the lower end. Also, if you are looking to not have to take anything home at the end of the sale, price your items to sell. Best to ask yourself, “What would I expect to pay for this item?” Price it no more than what you would be willing to pay. Select Discount – Check the discount box if you want your item to be sold at half price on Saturday during the half price sale. If the box is not checked your item will not be sold at half-price and may miss its chance of being sold. Will show as red star on printed tag. Select Donate – Check the donate box if you want your unsold items donated. All items with tags selected for donate, will be donated. Will show as “D” on printed tag. NOTE: All items must be picked up by 8:00 pm on Saturday or they will be donated to a charity, regardless of what you indicated on the bar-coded tag. Click the “Submit Item” button. Now all your information is entered into the online tagging system! When you are ready to print your tags: Select one of the ‘Print Tags’ options from our online tagging system. If you don’t have access to a printer which will print on cardstock then after printing on paper please staple your paper tags to index cards or cardstock. Also, EXTREMELY important, make sure the back of the tag is blank. If you print tags on both sides of the paper we have no way of knowing which item actually sold. Please remember to clean your printer heads and have adequate ink in your printer. If your tags print faintly they will not scan. You are ready to attach tags to your items! NOTE: Tags may NOT have handwritten changes on price, discount, or donate. Make a new tag if you make a mistake or change your mind about a price or item description. You will NOT be able to make any changes to your tags once they are checked in to the sale. Changes made by hand will NOT be accepted at check-out lanes. PLEASE DO NOT TAPE OVER BARCODES.